I’m late posting my bento this afternoon but I actually ate several hours ago. I decided to have leftovers today since I made way too much spaghetti the other night. 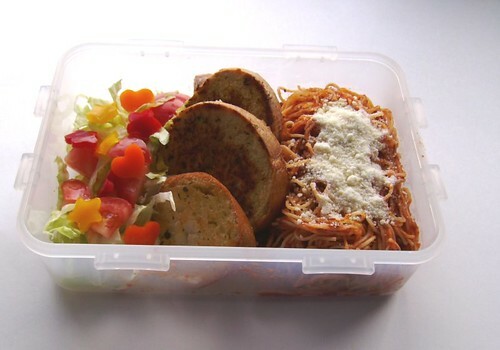 Nice and simple spaghetti with meat sauce and parm cheese, a few small rounds of garlic bread and a green salad. I used a Lock & Lock box for todays bento because I was STARVING by the time I ate and it’s quite a bit bigger than my other bentos. I cleaned my 18 gallon fish tank from top to bottom this morning and of course I skipped breakfast because I got sidetracked. Besides, who wants to eat when they’re covered in fish water? Not me! I know I should have waited a couple of days for my back to feel better before messing with that fish tank but I had my last lonely guppy die this morning and I didn’t want to leave it sit. My ancient goldfish is now inhabiting the large tank and I can finally break down the 10 gallon tank I had him in. Tonight will be a liberal dinner of non-asprin and ibuprofen I think. These little bento’s are really cute! You really do find the neatest things to do! I’m sorry your back is still miserable. I hope it gets all better soon! I hope you guys had a good easter!